Large horsepower compressors will boost Natural Gas Services’ margin in the medium- to long-term while the growth in natural gas production will drive revenues. The company has a negative net debt which indicates a healthy balance sheet. Energy upstream producers’ capex discipline and a weak natural gas price will keep its stock price suppressed in the short-term. Natural Gas Services Group (NGS) provides compression equipment to the natural gas producers operating primarily in the U.S. non-conventional shales. I think the current softness in natural gas price and upstream producers' lower capex budget in 2019 can adversely affect the company's margin at the operating level. Its revenues, however, can increase following natural gas production growth. The opposing forces can keep its stock price range-bound in the short-term. The energy mix is likely to shift towards more natural gas production, as studies from the leading agencies show. In this scenario, the demand for processing and related services including midstream infrastructure will increase, too. NGS's primary focus has been large-horsepower compressor units, which due to relatively high entry barriers, can be more profitable. While there is short-term pricing pressure, it could ease once running the medium-sized compressors become profitable. A margin expansion can take the company's stock price higher in the medium to long run. 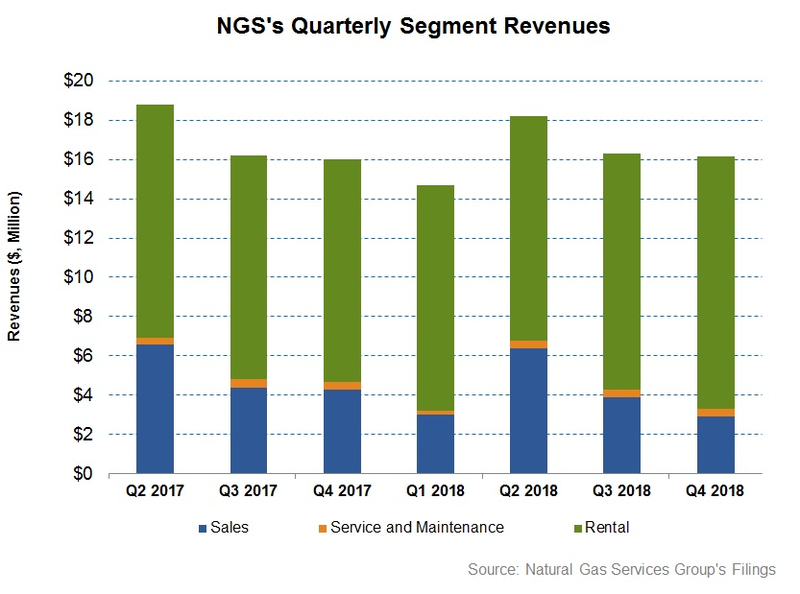 Over the past few years, the shift towards oil-associated gas production increased NGS's rental-based revenues coming from the non-conventional oil shale plays. The declining reservoir pressure in maturing natural gas producing fields and artificial lift applications have been driving servicing requirements through natural gas compressors. NGS's customers have also moved towards centralized drilling and production facilities which have increased the need for larger horsepower compressor packages. So, NGS has been shifting cash and fabrication resources towards designing, fabricating, and renting gas compressor packages that range from 400 horsepower to a higher horsepower. Approximately 18% of the company's utilized horsepower was large horsepower as of December 31, 2018. In the past year, NGS has added 31 new fleet units totaling 29,500 horsepower, which represents an increase of 25% in fleet horsepower. Its rental fleet utilization increased from 55% in Q3 2018 to 58% in Q4 2018. The company's rental fleet horsepower is booked for the next four or five quarters. According to NGS's management, it can add more speculative units and more anticipated contract. Although the company's current view indicates steady demand for high-horsepower units, the current momentum implies higher horsepower units can see increased demand in the next year. Investors may note that operating large compressors requires significant capital investment, which is why the producers prefer to have them rented and managed. Medium-sized compressors, however, may have more demand for outright purchase by the producers. So, renting versus the sale of compressors would depend on the size of the compressors. 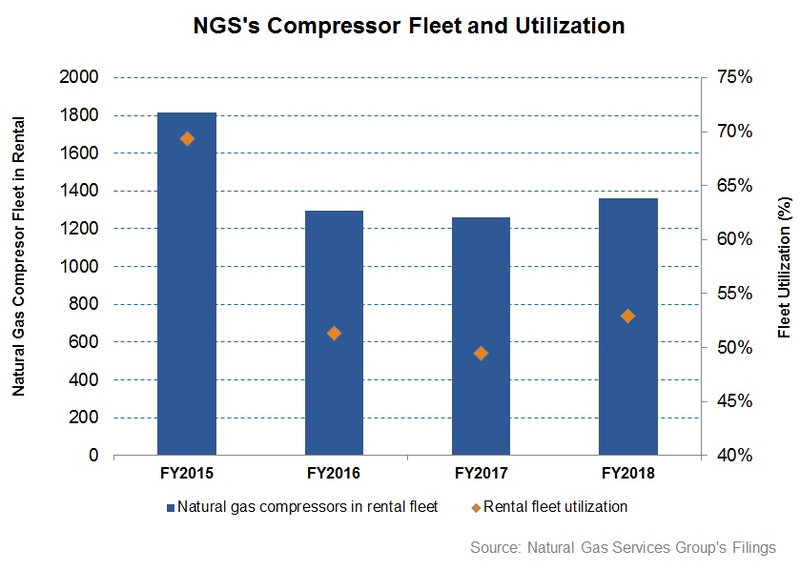 In this context, let us see how the company's Gas Compressor Rental segment has been performing. In Q4 2018, the segment, accounting for 79% of the company's revenues, increased by 7% compared to Q3 2018. The increase was due to improvement in utilization and higher horsepower rental units. In this context, let us check in the details of how natural gas production and price have been shaping up, and what do they indicate about NGS's outlook. 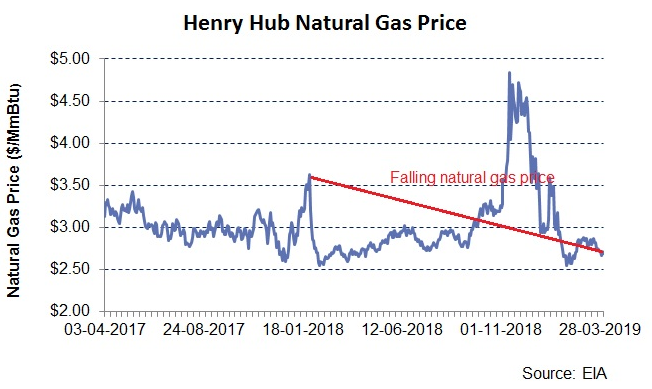 On average, the Henry Hub natural gas price decreased by 6.7% in 2018 compared to 2017. Oversupply concerns and an inventory glut generally led to the weakness in price. While the gas price spiked in November, it did not hold and fell sharply afterward. In 2019 so far, the natural gas price has declined by 14%. In the first quarter of 2019, lower liquefied natural gas (LNG) export and the pipeline capacity constraints have contributed to the weakness in natural gas price. The EIA expects natural gas spot prices will average $2.85/MMBtu in 2019, down 10% from 2018. Lower natural gas price can lead to lower revenue and operating profit margin for the natural gas producers that in turn may reduce their capex spend. Lower upstream capex can lead to pricing pressure for the natural gas servicing companies like NGS, and affect their outlook negatively. Despite low prices, natural gas production has continued unabated. 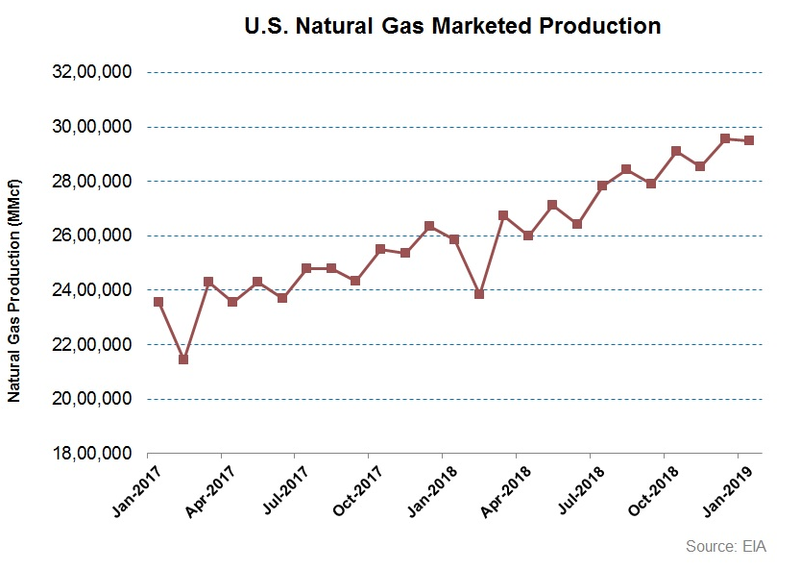 The U.S. natural gas marketed production increased by 12% in December 2018 compared to a year ago. Although production remained nearly unchanged in January 2019, the EIA expects natural gas production will continue to rise in 2020. It expects that strong growth in U.S. natural gas production will put downward pressure on prices in 2019. 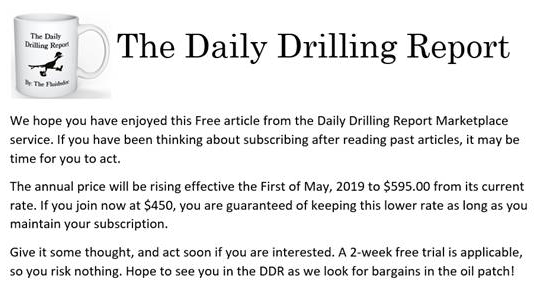 NGS's management thinks that though the natural gas market remains in oversupply, the pricing for the large- and medium-sized compressors is getting tighter. The company's pricing was relatively resilient in the face of a downturn in Q4, although the fleet utilization fell sharper than the industry rate. I have already discussed the company's utilization and horsepower addition in this article. The strategy of keeping pricing relatively steady can work in the company's advantage, because unlike its competitors, it may not need to raise the price much when demand does improve. This may allow the company to gain market share based on more competitive pricing. The higher natural gas production implies the compressors will continue to have stable demand in the market in the short-term. However, if the price stays low for long, it will eventually catch up with production, in which case, it will start affecting NGS's top and bottom line. In contrast to the Gas Compressor Rental segment's steady performance, Engineered Equipment Sales segment revenues declined by 25% in Q4 2018 compared to Q3. The segment, which includes compressors, flares, and aftermarket activities, is relatively unpredictable because the market and customer preference drive this business. Both of these factors are volatile. In Q4, a decrease in part sales and lower compressor and flare sales caused revenues to fall. Revenues from the Service and Maintenance segment remained relatively steady (3% down) in Q4 compared to Q3. Although revenues remain steady in Q4 compared to the previous quarter, the company's adjusted gross margin improved to 51% compared to 48% in the last quarter. A couple of factors contributed to the improved margin: higher gross margin in the rental business and a shift in the mix towards higher-margin rentals. However, at the operating profit level, the company's margin remained muted due primarily to marginally lower Engineered Equipment Sales revenues. Compared to NGS's operational concentration in the non-conventional energy basins in the U.S., Exterran Corporation (EXTN) provides natural gas compression services in North America, Latin America, the Middle East/Africa, and the Asia Pacific regions. As 2019 rolls on, the infrastructure de-bottlenecking in North America seems to improve EXTN's outlook. However, the pricing pressure in natural gas plus a reduction in drilling rigs is leading to uncertainty over the producers' capex commitment and the resulting demand for new gas plants. Outside of North America, EXTN's management sees growth prospect in both contract operations and aftermarket services in the Middle East/Africa, while in the Asia Pacific, it finds increased work in FPSO (floating production storage and offloading vessel) upgrade. So, a lack of geographical diversity and a heavy concentration on compression business increase NGS's risk profile compared to some of its peers. In FY2018, Natural Gas Services' cash flow from operations (CFO) was $23.4 million, which was a 34% increase compared to FY2017. Despite a 3% fall in revenues, the improvement was due primarily to a decrease in trade accounts receivables. The company's cash and cash equivalents were $52.6 million and working capital was $100.8 million on December 31, 2018. The company's net debt is negative because of an insignificant debt and a healthy cash balance. In FY2019, Natural Gas Services plans to spend $37.5 million to $40 million in rental compression capex. So, its capex will remain unchanged compared to FY2018. With the available liquidity (cash balance and undrawn revolving credit facility), the company does not require additional external financing to meet its capex needs and near-term financial obligations. What Does The Relative Valuation Imply? Natural Gas Services is currently trading at an EV-to-adjusted EBITDA multiple of ~8x. According to sell-side analysts' estimates, the forward EV/EBITDA multiple is ~6x. From FY2013 to FY2018, its average EV/EBITDA multiple was 8.1x. So, the stock is currently trading in line with its past six-year average. The forward EV-to-EBITDA multiple contraction versus its adjusted trailing 12-month EV/EBITDA is steeper compared to the industry peers' average multiple compression, which implies the EBITDA is expected to improve more sharply compared to the peers' average in the next four quarters. This would typically result in a higher current EV/EBITDA multiple compared to the peers. 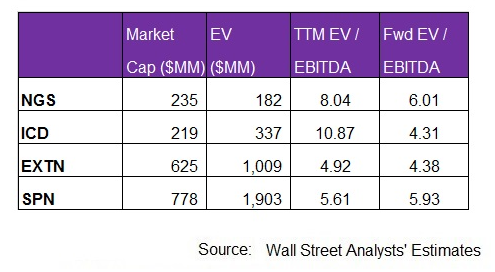 Its EV/EBITDA multiple is higher than its peers' (ICD, EXTN, and SPN) average of 7.1x. I have used estimates provided by Thomson Reuters in this analysis. According to data provided by Seeking Alpha, five sell-side analysts rated NGS a "buy" in March (includes strong buys), while none recommended a "hold" or a "sell". The consensus target price is $25.4, which at its current price yields ~43% returns. What's The Take On NGS? The long-term growth drivers for natural gas have remained unchanged. According to EIA's estimates, this form of energy will occupy the majority of the world energy mix. As the energy mix shift towards more natural gas production, the demand for processing and related services including midstream infrastructure will increase, too. To benefit from this changing scenario, NGS has been adding to its compressor fleet to benefit from higher natural gas production. Its primary focus has been large-horsepower compressor units, which due to relatively high entry barriers, can be more profitable. In Q4 2018, the company was able to improve its adjusted gross margin. Although production has been trending up, NGS's primary concern has been the volatility in the natural gas prices. In 2019, it is expected to remain weak. A lower rate can adversely affect the margin at the operating level in the short-term. The pressure should ease in the medium to long run once running the medium-sized compressors become profitable. Plus, NGS has no debt. The company can be a good investment once it goes past the growth impediments.